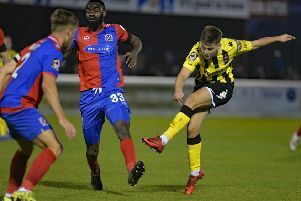 AFC Fylde midfielder Andy Bond says that the team can’t lose their focus as they aim to push towards promotion from the Vanarama National League North. The Coasters are currently nine points clear at the top of the league following a 3-1 win over FC United of Manchester coupled with Kidderminster Harriers’ 3-0 defeat to Salford City last time out. Bond reiterated the importance of the squad carrying their good form into the final few months of the campaign. “We can’t take our foot off the gas,” said Bond. “You go into every game obviously wanting to win it and there is no easy game in this league. The Coasters have enjoyed a weekend off due to Alfreton Town’s involvement in the FA Trophy, but now face three games in seven days. Even with no game, Bond says there has been no let-up in the Coasters’ preparation for the clash against Curzon Ashton this weekend. He said: “I can’t remember the last time I had a Saturday off to be honest. It’s strange being a footballer and not having a game on the Saturday but we’ve worked through the week and we’ll work through this week to prepare for the game at Curzon. Bond joined Fylde in the summer from League Two side Crawley Town and has been an almost ever-present for the Coasters, starting 24 of Fylde’s 30 games in all competitions. The former Barrow and Colchester midfielder has also chipped in with three goals so far this term, including the third in the 3-1 win over Chorley on New Year’s Day, and is pleased with his contribution. “I’m very happy considering that we’re sitting top of the league but it’s not just me that’s made an impact,” he said. “It’s a collective thing and we’ve worked as a team all season. We win as a team, we lose as a team and we’ve got to keep it going. “I think it’s good with all the competition that we’ve got at the club. I’ve played most of the games this season but I know that if I’m not on my game there are lads to come in and fill the spot. “At this moment, we’re in a great position. But we can’t rest on our laurels.